Miles of Smiles: Happy farm kids who recovered their “tooth fairy” packs comprising a toothbrush and toothpaste last month. Now that the budget approvals are in place, SAFE is steaming ahead with plans to make life happier and a lot healthier for SAFE farm kids. 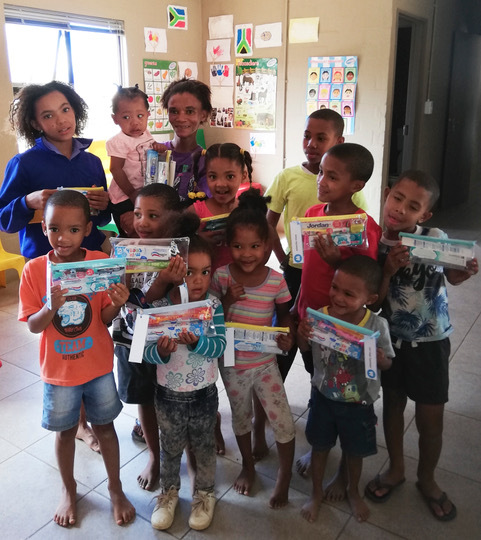 Last month SAFE head office staffers packed 50 oral hygiene packs, each one comprising a toothbrush, toothpaste and a note on oral hygiene, for creche and aftercare children at Bonathaba and Zwartfontein; two SAFE farms close to Cape Town. The project for April is a rich kitchen revamp at Zwartfontein. “We have budget approval to buy the kitchen appliances and equipment we need to make sure that each of the creche-going children, whose parents work at the farm, have at least two healthy meals a day,” said Chantelle Thompson, SAFE’s Logistics Manager. A fridge, a stove, and general kitchen equipment such as crockery, cutlery, plastic ware, and pots and pans have been bought for the creche. Now the kitchen will be surveyed to make sure it complies with safety regulations ensuring that there is no danger to the tiny tots when meals are being prepared. “The idea is for the kids who come to the creche to enjoy a healthy breakfast. This will help them concentrate on the learning program”, says Chantelle. “The children will also be served lunch”, she added. “We believe that employees on all our farms ought to have a safe and secure environment for their children while they are at work. In the long term, all six SAFE farms will benefit from the initiative of upgraded creche facilities. Schools and creches of neighbouring SAFE farms will be supported if there are no in-house facilities on any particular farm. “We believe strongly in supporting the community upon whom we rely to grow our business success,” said Dries van Rooyen, SAFE’s General Manager of farming operations. “Our support for the children of the people who work for us is just one way of showing that we are a company that takes a practical interest in the welfare of our staff and their families”.